However, let’s remove the crisis years and look at the current index as compared to the index from 1990 – 2008. We can see that, even though prices have increased, historically low mortgage rates have put the index in a better position than every year for the nineteen years prior to the crash. 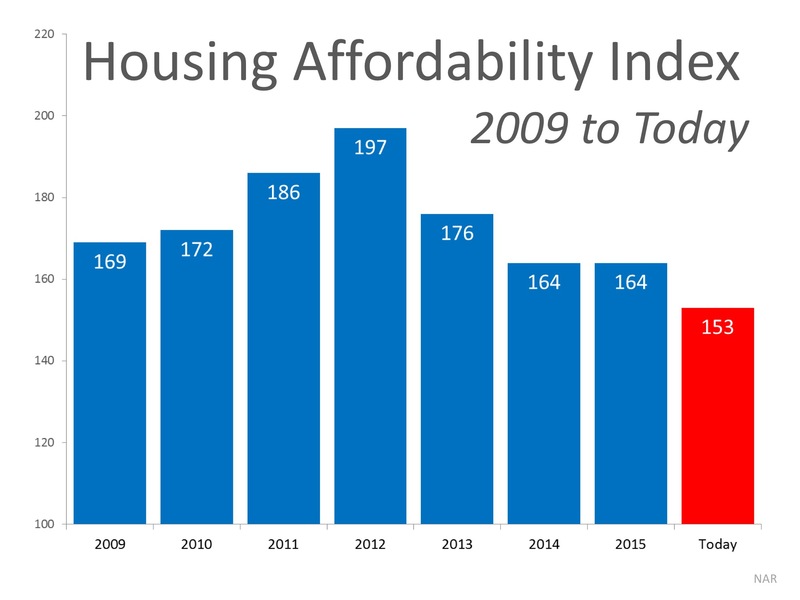 The Housing Affordability Index is in great shape and should not be seen as a challenge to the real estate market’s continued recovery. 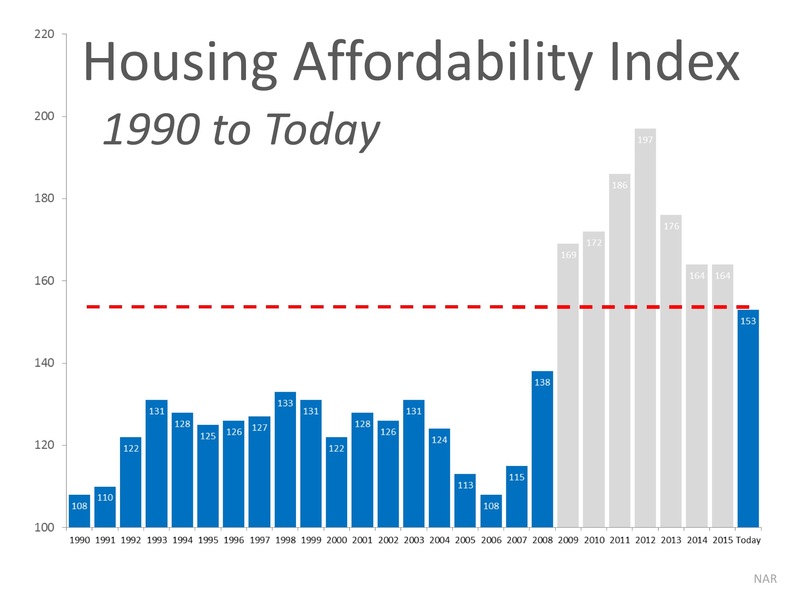 There are some that think that housing affordability is a challenge. Historically, that’s not true. Others think that home prices are approaching bubble values. If we look back over the last sixteen years, that is also not the case. As a matter of fact, the numbers show that the U.S. residential real estate market is doing just fine. “A growing body of research shows that during presidential election years — particularly ones like this when there is such uncertainty about the nation’s future — industry becomes almost paralyzed. A look at the last several dozen election cycles shows that during the final year of a presidential term, big corporate investments are routinely postponed, and big deals are put on the back burner. We are seeing this take form in the latest economic numbers. However, will this lead to a slowdown in the housing market? Not according to Fannie Mae, Freddie Mac or the National Association of Realtors. Let’s look at what has happened and what is projected to happen by these three major entities. Even during this election year, the desire to achieve the American Dream is greater than the fear of uncertainty of the next presidency. Home sales are up 1.5% year-over-year and 5.1% month-over-month. Demand is still much higher than the available housing inventory which declined 2.2% from March 2015. This is the 49th consecutive month with year-0ver-year price gains. Where is Housing Headed for the Rest of 2016? Will disappointing economic news adversely impact housing? Is affordability a major concern in today’s real estate market? Are we approaching a new housing bubble? Are mortgage standards too tight? Or have they loosened too much? “Recent data darkened the growth outlook for the first quarter of 2016. However, despite the disappointing economic reports, we still forecast housing to maintain its momentum in 2016.
ahsiekbuyersBuyers in Elk GroveBuyers in Sacramentobuying in elk groveCalifornia Real EstateElk GroveElk Grove Real EstateEngineOfGrowthFreddieMacKeisha MathewsMathews & CompanyPositiveViewOnHousingreal estatereal estate saleSacramentoSacramento Real EstateSellersselling homes in Elk GroveSelling Homes in SacramentoSelling in Elk GroveSwehtamWhereIsHousingHeaded? The price of any item is determined by the supply of that item, and the market demand. The National Association of Realtors (NAR) recently released their latest Existing Home Sales Report which gives insight into today’s market conditions. Sales of existing homes rose 5.1% month-over-month in March and are 1.5% higher than this time last year. Sales rose in all four major regions in March. 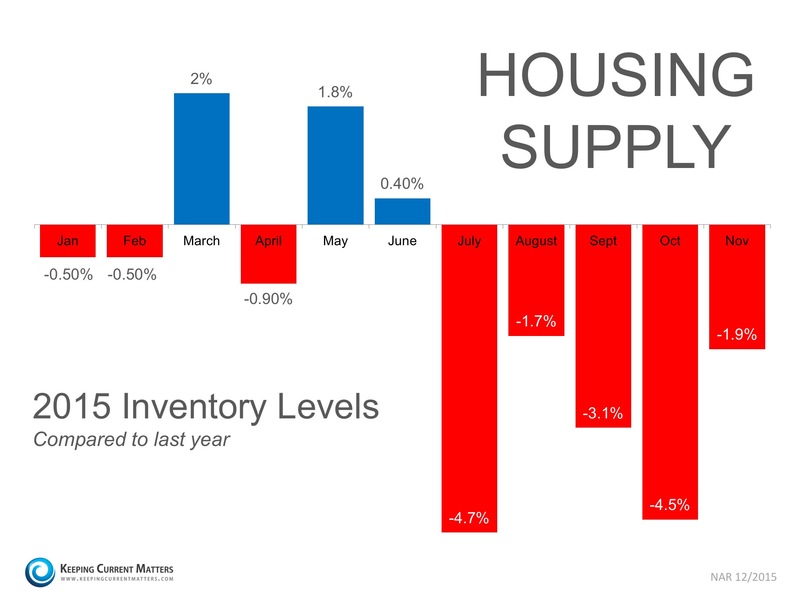 Total unsold housing inventory is 1.5% lower than March 2015 at a 4.5-month supply and remains well below the six months that is needed for a historically normal market. Consumer confidence is at the highest level in over a decade. Pair that with interest rates still below 4%, programs available for down payments as low as 3%, and you have an attractive market for buyers. Homes sold in March were on the market for an average of 47 days and 42% of properties sold in less than a month. March marked the 49th consecutive month of year-over-year price gains as the median price of existing homes sold rose to $210,700 (up 5.7% from 2015). 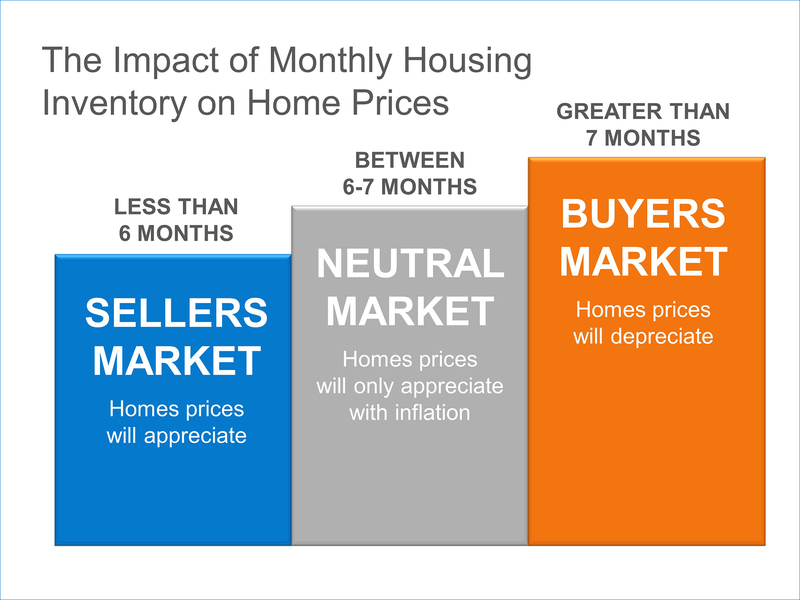 The chart below shows the impact that inventory levels have on home prices. If you are debating putting your home on the market in 2016, now may be the time. The number of buyers ready and willing to make a purchase is at the highest level in years. Let’s meet up so we can get the process started. What factors are driving home prices up? It is easily explained by the theory of supply and demand. There is a lack of housing inventory for sale while demand for that inventory is very strong. According to a recent survey of agents by the National Association of Realtors (NAR), buyer traffic was seen as either “strong” or “very strong” in 44 of the 50 states (the exceptions being: Alaska, Wyoming, North Dakota, West Virginia, Connecticut and Delaware). Also, in NAR’s latest Pending Home Sales Report, it was revealed that the index was the highest it has been in a year. What does the future bring? As prices rise, more families will have increased equity in their homes which will enable them to put their home on the market. As more listings come to market, price increases should slow to more normal levels. Top Reason to List Your House For Sale Now! The latest Existing Home Sales Report shows that there is currently a 5.1-month supply of homes for sale. This remains lower than the 6-month supply necessary for a normal market and well below November 2014 numbers. Anything less than a six-month supply is considered a “Seller’s Market”. Meet with a local real estate professional who can show you the supply conditions in your neighborhood and assist you in gaining access to the buyers who are ready, willing and able to buy now! For most homeowners, being financially ready to sell comes down to one factor: equity. During the housing meltdown of 2008–09, millions of homeowners found themselves with negative equity, which meant they owed more on their homes than they were worth. Clearly, selling your home when you have negative equity is a bad deal. That’s called a short sale, and it impacts your credit almost as much as a foreclosure. Breaking even on your home sale is better, but it’s still not ideal. If you’re in either situation, don’t sell unless you have to in order to avoid bankruptcy or foreclosure. For the last several years, home values have been on the rise, and that means most homeowners are building equity. Their homes are now worth more than they owe on them, and that trend will persist as they pay down their mortgages and home values continue to increase. Financially speaking, it is best to sell your home when you have enough equity to at least cover the down payment on your next home. Or, you can go all the way and use the proceeds to buy your next home outright—no more mortgage for you! To figure out how much equity you have in your home, first find out your mortgage balance. That’s easy enough—simply look on your latest mortgage statement. Next you’ll need to know how much your home is worth. While it’s tempting to use figures from online home valuation sites, they’re not always accurate. You don’t want to base such an important decision on iffy information. Contact a real estate professional who will compare your home to others that have recently sold and take local market trends into account. You can trust their estimate to reflect what your home is worth based on their experience selling homes in your area. Are you ready to put in the work to get your home ready for house hunters? Are you committed to keeping it ready to show for weeks or months? Are you ready to hear the reasons why potential buyers believe your home is not perfect? Are you ready for honest—and sometimes hardball—negotiations over what buyers are willing to pay for your home? Are you really ready to move out and leave the place where your family has made memories? Don’t get us wrong; we’re not trying to talk you out of selling your home! We just want you to be completely ready when you do decide to move on to the next stage of your family’s life. A qualified real estate agent will give you a clear picture of what it’s like to sell a home and if now is the right time for you, both financially and emotionally. Sales volume for December surged 30.4% to 1,571, a substantial increase from the 1,205 closed escrows in November. The current number is 3.3% above the 1,520 sales of October. Compared with December 2014 (1,313 sales), the current number is up 19.6%. Equity sales made up 90.9% of all sales (1,428 units) for the month. The remainder of sales were REO/bank‐owned (57 units/3.6%) and Short Sales (60/3.8%). Other types of sales (auction, probate, etc.) accounted for 1.7% or 26 sales. Both REO Sales (2.7%) and Short Sales (17.3%) decreased for the month. Equity Sales increased slightly, up .4%. Pending sales dropped off to 849, a 31.4% decrease from the 1,237 pending sales in November. Compared with December 2014, however, the current number is up 4.7% (811). The month‐to‐month median sales price jumped 2.1% from $290,885 to $297,000. This figure is 10.8% above the $268,000 median sales price for December 2014. The total dollar value of all closed transactions for the month totaled $508,723,362. This figure is 30.3% higher than the $390,353,522 total last month and 31.7% higher than the total value of December 2014 ($386,253,993). The year‐end sales total is 17,578, up 11.4% from the 15,778 sales at the same time of last year. The total Active Listing Inventory decreased 18% from 2,150 to 1,749 and the Months of Inventory remained decreased from 1.8 months to 1.1 months. Year‐to‐year, the current number is down 27.9% (3,002 units). The average DOM (days on market) for homes sold this month increased from 33 to 35 days. The median DOM increased 31% from 16 to 21. These numbers represent the days between the initial listing of the home as “active” and the day it goes “pending.” Breaking down the DOM, there were 964 listings that sold between 1 – 30 days, 329 listings between 31 – 60 days, 136 between 61 – 90 days, 68 between 91 – 120 days and 74 sales that spent over 120+ DOM. The Sacramento Association of REALTORS® is a professional association representing over 5,500 real estate professionals and commercial affiliates doing business in the greater Sacramento metropolitan area. All SAR statistics reports compiled by Tony Vicari, SAR Communications Manager. Statistics are derived from the MetroList® MLS database for Sacramento County and the City of West Sacramento.